Required Reading is DoomRocket’s love chest, opened twice monthly to champion a book that we adore. This week Arpad recommends the trade paperback edition of ‘Beasts of Burden: Animal Rites’, out May 16 from Dark Horse Books. By Arpad Okay. 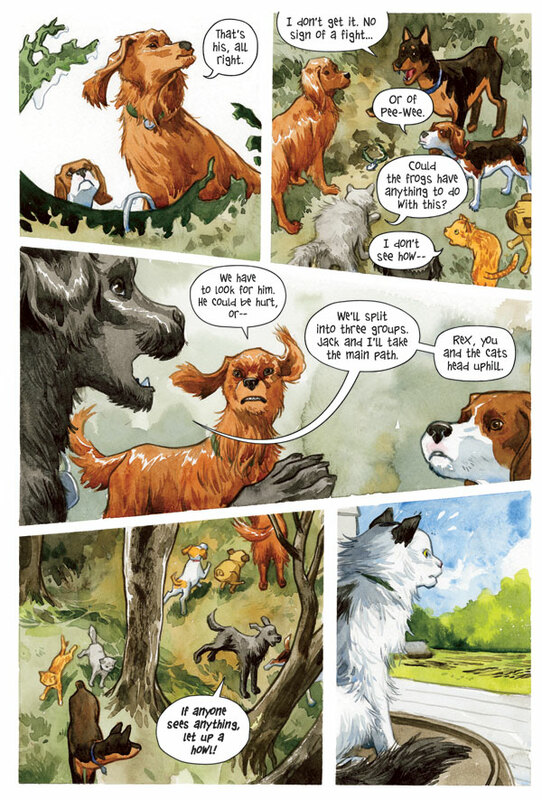 Beasts of Burden is a classic team book. The OG Defenders on four legs, oddball personalities bouncing off each other as they solve paranormal crises. It’s a pet book, too, with each Beast their own idiosyncratic character, based on breed, their status of bought, adopted, or stray, the little peccadilloes of stubbornness or cowardice in contrast to their bravery, compassion, devotion. You know, pet stuff. The town of Burden Hill is an ideal setting, the rural suburban horror of Wes Craven in his prime. But our animal buddies are facing off against Guillermo del Toro folk monsters. Frogs, witches, zombies, rat-kings and werewolves, ghosts and possession, the kind of horror one would expect more from the Brothers Grimm than celluloid. 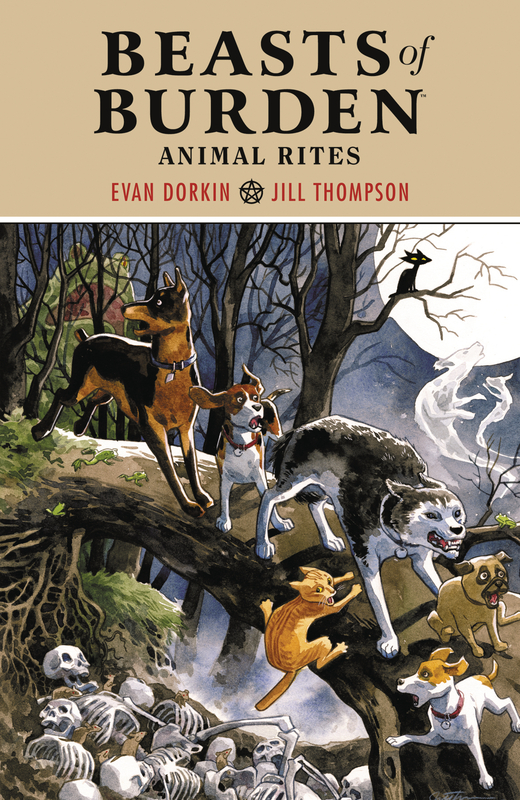 Evan Dorkin and Sarah Dyer really pour their all into making the dogs, cats, and the other fauna of their book memorable, three-dimensional, and frequently hilarious individuals. You could follow any one of them on their own story (and sometimes do). They’re more than a name, each pup has a personality, a history. Rex, Ace, Pugsley, Jack, the Orphan, Whitey, and Dymphna, they are us. When we are strong, curious, when we grouse, when we love. They are us afraid and when we’re brave. More than a team, when combined they mirror humanity whole. Definitely still doggos, though. The disembowelments and the belly laughs are evenly matched in Beasts of Burden. Solemn oath slams into fall-down, I’m-in-trouble-and-boy-I-know-it puppy panic. Sometimes tug of war is the best defense. Dorkin and Dyer allow things to get pretty absurd, which is perfectly on brand. In peril and in peace, a book about cats and dogs needs pure sweetness to feel true. Beasts of Burden is a horror title, make no mistake, but it has many moods, and the love is there. The depth makes the funny funnier and the dark pitch black. Jill Thompson’s versatile mastery of watercolor matches the flexibility and sophistication of the scripts she works from. Detailed or simple, the page is always full but never cluttered. Call her succinct. The colors are subdued and natural, the style a breathtaking blend of realism and cartoonish that defies comparison because Thompson has been the apogee of the style for decades. Jill’s work is occult tome white magic. 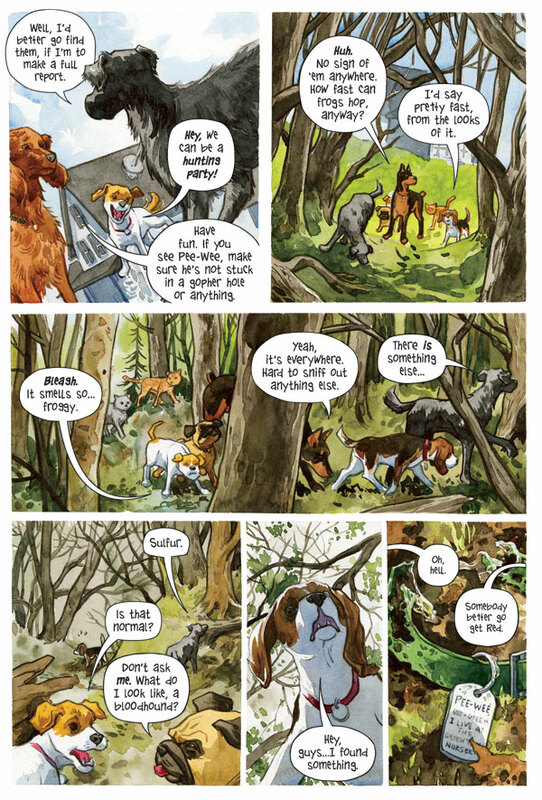 On the pets, the woodsy backdrops, the gooey bits — the comedic and the grotesque can often share a panel — each moment is built up with just the right details. Her characters are gothic and sunshine at once. The natural inclination for horror is dark, blacks, greys, reds. Beasts of Burden is rainbow forest midday, bold, brave, optimistic. The texture is the medium itself: paper grain, stain lines, and brushstrokes. Thompson’s art is visibly that, fine art, and yet totally living, breathing, a presence. So together, Evan Dorkin and Sarah Dyer’s writing, Jill Thompson’s art, and Jason Arthur’s lettering take a comic of severe polarity and capture the impossible. What really does it for me more than any other aspect of the book is that it harnesses the power animals have over us, it gives them the anthropomorphism we wish they had, and betrays neither. We love pets because, despite being voiceless, we can know their hearts. We can see their devotion, their fortitude, their fear. We know their unspeakable truth without confirmation. When you tell a story that bridges the gap where animals can speak, it is easy to lose that importance, it’s easy to make them mouthpieces or broad caricatures of virtues. Beasts of Burden never loses the dog in the dogs, the kitty moments, the fury of a provoked raccoon. Beasts is a book of improbable feats that succeed. The back and forth between friends will make you laugh and make you tremble. But never for a moment is the impact of that pure connection between animals and us compromised. Beasts of Burden will surprise you, delight you, and cut you to the bone. Read it. Written by Evan Dorkin and Sarah Dyer. Letters by Jason Arthur and Jill Thompson. 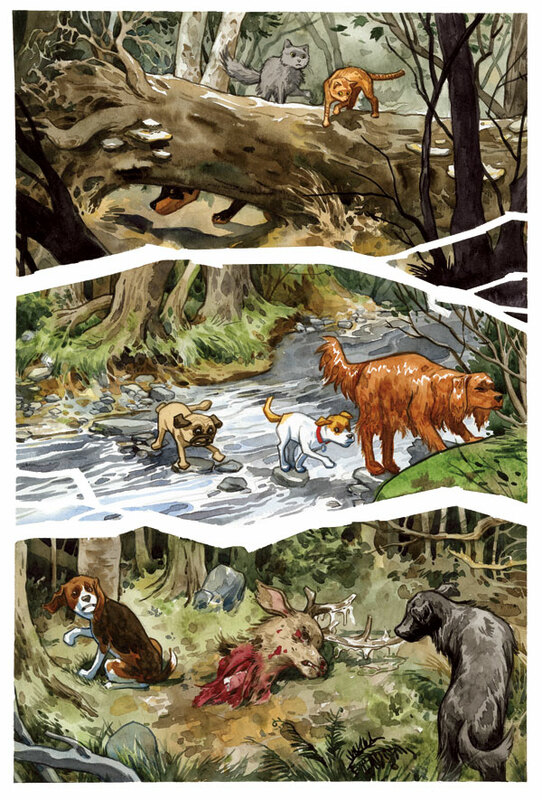 ‘Beasts of Burden: Animal Rites’ TPB hits stores May 9.